Dr. Babb graduated from the College of William and Mary in Williamsburg, VA with his Bachelor of Science in Biology. He earned his medical degree at Eastern Virginia Medical School in Norfolk, then completed a Family Practice Residency at Lancaster General Hospital in Pennsylvania. A few years later, Terrence completed his Obstetrics and Gynecology Residency at University of North Carolina (UNC) Mountain Area Health Education Council (MAHEC) in Asheville. Before coming to SEARHC in 2015, Dr. Babb was in private practice in OB/GYN for several years, then worked nearly 10 years as an OB/GYN Consultant Staff member for Clearfield Hospital in Clearfield, PA. He also served as a Locus Tenens for: the United States Military Academy in West Point, NY; Indian Health Services in Pine Ridge, Ft. Thompson, and Lower Brule, SD; Blackfeet Community Hospital in Browning, Montana; Bassett Medical Center (Columbia University) in Cooperstown, NY; as well as multiple hospitals in South Dakota including Spearfish Hospital and Rapid City Regional Medical Center. 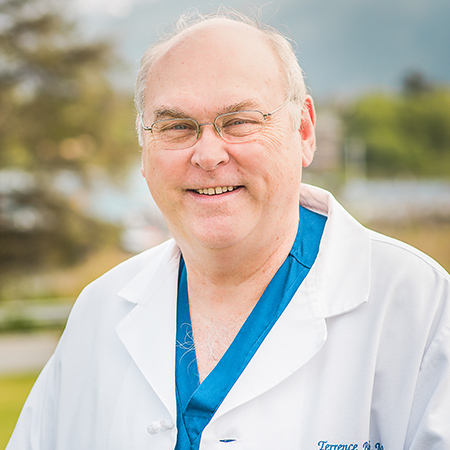 Terrence Babb spent part of his childhood in Delta Junction, Alaska and is now thankful for the opportunity to return to the state and serve the patients of Southeast Alaska. Lewis Rathbun M.D. Award given to the Chief Resident whose paper represents a significant contribution to the field of Gynecology. Holmes Gillette Award Recipient, Eastern Virginia Medical School (EVMS), Norfolk – awarded annually to a member of the graduating class who is considered by fellow student and faculty to epitomize the ideals of EVMS. Dr. Babb’s medical interests include Consultant in General OB/GYN. Outside the office, he personally enjoys fishing and classic cars.